Perennial herbaceous climber or undershrub, often cultivated as an annual. Leaves compound, trifoliolate with a short rachis and a 6-20 cm-long petiole; leaflets ovate, mucronate, green on the upper surface, on the lower surface, 8-15 cm long, 5-10 cm wide. Inflorescence an axillary raceme, up to 15 cm long, peduncle up to 20 cm long. Flowers papilionaceous, lilac or white. Petals 3.5 cm long. Fruit a legume, linear-oblong, flat, keeled, 15-40 cm long by 3-5 cm wide, seeds 8-20. Seeds oblong-ellipsoid, compressed, 2.5-3.5 cm long, 1.5-2 cm wide, white, grey or red; hilum 1.5- 2 cm long. A similar species, C. ensiformis, the pod is 8 times or more longer than wide; hilum is less than half the length of the seed. 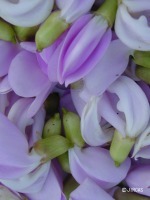 Canavalia gladiata (Jacq.) DC. is of Asiatic or Afirican origin while C. ensiformis originate in the New World. 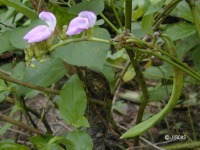 The young shoots, young pods and flowers of the sword bean are served blanched with nam phrik. The sour-tasting leaves are put in tom yam soup or eaten blanched with vermicelli and peanut curry. The young pods can be used in curries or fried. Both species are grown from seeds by direct seeding at c. 45 cm between plants and c 75 cm between rows. They prefer full sun.